As your child gets bigger, their car seat needs change too. Choose the versatile Maxi-Cosi RodiFix from Maxi-Cosi Outlet for your growing child without compromising on safety. It’s suitable from 3½ years until they no longer need a seat at the age of 12 years. It fixes simply and quickly into your car using retractable IsoFix connectors for a stable fit. The backrest is designed to recline to follow the shape of your car’s seat, for a better fit. And as the RodiFix is light to carry, it makes it easy to switch it between cars for your convenience. 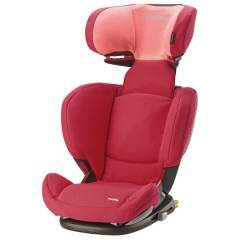 The Maxi-Cosi RodiFix offers superb safety features for your peace of mind. It uses your car’s three-point seat belt to hold your child securely if you make a sudden stop. 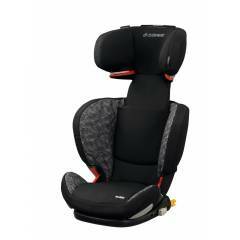 Easy-glide guides at the side hold the seat belt at the right height across your child’s chest for quick positioning. The headrest has side impact protection to reduce the risk of head injury in side-on collisions. And the seat is specially shaped to protect your child’s hips and back from side impact. There’s a big difference in size between a preschooler and a 12 year old. The Maxi-Cosi RodiFix car seat grows with your child so it always fits perfectly for optimum safety. As your child gets taller, you can adjust the height of the headrest quickly and easily from the top. This means your child’s head is protected and the seat belt is held correctly at every age. The sides of the car seat can also adjust to offer optimum protection and comfort as your child grows.